So, what hath the pioneers of Maine craft brewing wrought? In the mid-’80s, on the cusp of the microbrewing trend, it turns out this wasn’t a trend at all. Horn-rimmed glasses, the Walkman, the Cabbage Patch Doll and the Rubik’s Cube were all ’80s trends. But beer? Nope. In fact, beer made on a relatively small scale and handcrafted with the utmost care is a phenomenon that had staying power. Today, with nearly 40 craft brewing companies in Maine, there doesn’t seem to be any let-up to the momentum of microbrewing. And Maine has a diverse selection of breweries that share one common theme: They are serious about making an absolutely great product. And when we say diverse breweries, we really mean it. Take Friars’ Brewhouse in Bucksport, for example, where one of the Franciscan Brothers of St. Elizabeth of Hungary—Brother Donald Paul—brews his trademark Whoopie Pie Porter. Or Maine Beer Company, which has a mantra of “Do what’s right” and gives a percentage of its profits to environmental non-profits. Then there’s Penobscot Bay Brewery in Winterport, where above and beyond the many beers they brew, their own beer-flavored ice cream is served. Don’t knock it ’til you’ve tried it. 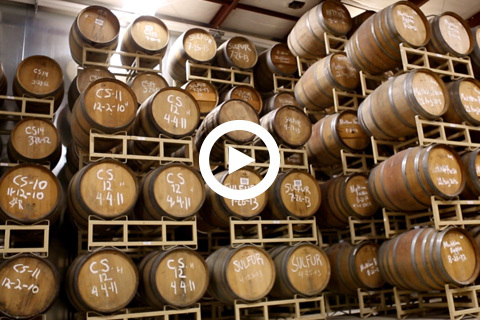 In Maine, few breweries have received as much notoriety as Allagash Brewing Company in Portland. 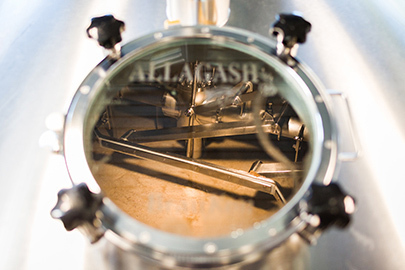 In 2012, TripAdvisor named Allagash’s brewery tour one of the best in America. And Men’s Journal called Allagash White one of the best beers in America. What’s an Allagash, you say? To the uninitiated, the Allagash is a river in Northern Maine, a beautiful place that left a lasting impression on Allagash Brewing Company’s founder, Rob Tod, from his travels there as a kid. Rob’s love of Belgian-style beer brought him to the brewing business, and initially the public did not embrace it. Many inquired, “Why don’t you brew something more mainstream?” But Rob stuck with it, never wavered and did what any Mainer would do—gave it his all. Rob’s intense desire to make great, unique beer drives him every day. He speaks of their “wild, funky, experimental brews” and infuses some of his brews, aged in oak barrels, with fresh raspberries. The beer isn’t hard to find either: Allagash beer is distributed in Chicago, New York, Washington D.C., Philadelphia and Boston. Ironically, one of their biggest markets is Los Angeles. Those refrigerated trucks sure get a workout. We’d love to have a cold one after that long drive. But let’s bring it all back home, shall we? In fact, let’s take a trip into the woods, to a little farmstead in Newcastle, Maine, the home of Oxbow Brewing Company. 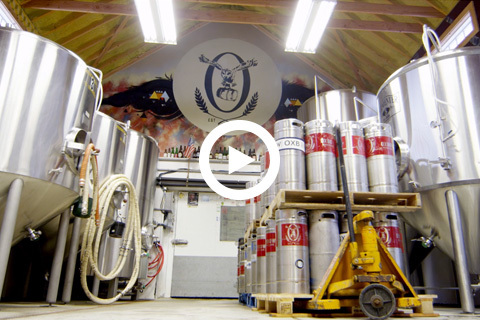 The founders of Oxbow Brewery exemplify the aforementioned industrious Mainer. Beer entrepreneurs Tim Adams and Geoff Masland acquired the property with no electricity or running water, which we would guess are a couple things you probably need to brew beer. No matter, the property is gorgeous in a way only Maine is—and they had the place up and running in no time. The 18-acre Oxbow Brewing Company is right down the street from a place called “Cowshit Corner” (again, you can’t make this stuff up). Going down a long drive through a line of pine trees reveals the tasting room and office, where you can place your order for an ice-cold Oxbow. Their two mainstays, Farmhouse Pale Ale and Space Cowboy Country Ale, are amazing farmhouse brews. The original outhouse is still there, and to your left is the brewhouse where all the goodness happens. Up on the hill to your right, there’s a house, where employees putting in long hours routinely take naps to get a refresh. “We have a lot of roofs over a lot of heads,” says Tim. This is the quintessential farmhouse, and there is a lot of work to be done above and beyond perfecting Oxbow’s trademark Belgian-style farmhouse beers. They tend to a few pigs and other farming operations—including growing fruit they use in the brewing process. Remarkably, they also self-distribute their beer. 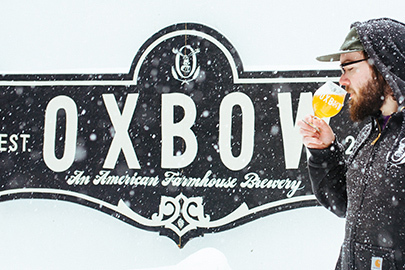 To brew Belgian-style beer requires special yeast called saison, and Oxbow is the only brewery in Maine that uses it. The idea of brewing beer in a farmhouse brings to mind the French term terroir. A term usually reserved to describe wine, it speaks to effects that the local environment—its geography and climate—has on the production of the product. Terroir is ever-present at Oxbow, the relaxed surroundings mirroring the easy-to-drink, smooth Belgian brews. The Oxbow vibe is perfectly captured in a saying posted behind the bar in their tasting room: “Loud beer from a quiet place.” Indeed. Luke Livingston, founder of Baxter Brewing Co. in Lewiston-Auburn, openly admits to a bit of “geekiness” when it comes to making beer. “We’re scientists,” he says, with a little chuckle. It’s not far from the truth. There are a lot of variables when it comes to making beer—from the ingredients to the environmental factors, every little bit matters. It’s that attention to near-scientific detail that goes into the making of Baxter’s signature brews—with such creative names as Phantom Punch and Tarnation. But there’s another side to brewing that concerns Luke and his ever-growing team—the toll brewing takes on the environment. “Ninety-nine percent of brewing is actually cleaning,” he says, this time with a serious tone. Brewing is by nature environmentally taxing, and Luke estimates that to make 1 gallon of beer, it traditionally takes 7 gallons of water. Because of their green practices, they’ve got that down to 4 gallons. Bravo. 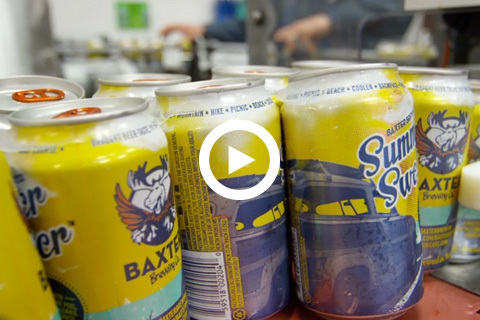 But what makes Baxter even more environmentally friendly is actually something simple: They distribute their beer in cans. Much better for the environment. Luke notes that 75% of bottles end up in landfills. By contrast, cans are 100% recyclable. Plus you can fit three times more product on a truck … and cans weigh less, aiding in fuel efficiency. If you enjoy a few brews on a weekend at the beach or playing 18 holes on a golf course, Luke notes that cans are more portable and much safer. Part of their conscious effort to do the right thing comes from Luke’s passion for being a responsible corporate citizen—and making Baxter a rewarding place to work. It is all encapsulated in their motto “We do what we can. We can what we do.” It’s a labor of love. 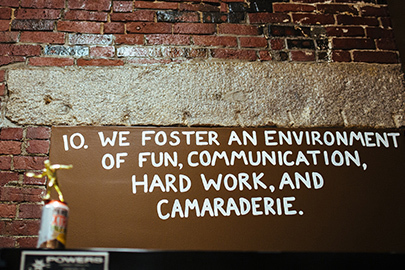 If you visit Baxter Brewing Co., you’ll certainly get a sense of camaraderie, friendliness, and good fortune.